With forced humor, too many characters, and boring action scenes, Spider-Man 3 was a disappointment. I was confident that the creators could make the third movie just as strong as the previous two, but I couldn’t have been more wrong. Though I usually don’t enjoy superhero movies, the last two movies had cliffhangers, captivating fights, and unique villains that kept me intrigued. But the third installment of the trilogy couldn’t even live up to its exciting, action-packed trailers. The plot was scattered, leaving me bored and confused throughout the entire two hours. Tobey Maguire returns as the valiant Spider-Man, now basking in his success as the hero of New York. Harry Osborn, (James Franco) knowing Spider-Man’s true identity, continues to think that Peter Parker killed his father (in the first movie) and is determined to avenge his father’s death. Meanwhile, an alien symbiote crashes into Earth and attaches itself to Peter, changing his suit jet-black and causing him to become more aggressive with his powers. Parker, who acts recklessly with his new suit, faces a rival photographer at the Daily Bugle, who threatens to steal his job with his own Spider-Man photos, and the Sandman, a shape-shifting sand monster. Besides the fact that the villains didn’t even look threatening—almost silly, in fact—most of the scenes in the movie were forced. It seemed obvious the makers were trying to be funny when they had Peter, overconfident because of the “evil suit,” strut down the streets of New York City with his hair gelled down in a dark and emo state, flirting badly with every girl he sees like an arrogant middle-school boy. It was even more ridiculous when he started salsa dancing in a jazz club. The special effects, on the other hand, were still as strong as they were in the previous two movies, but the film could hardly be called action-adventure with so few action scenes that were hardly satisfying. Instead, they were replaced with melodramatic, cringe-inducing scenes between Peter and Mary Jane (Kirsten Dunst) that had no depth to them. 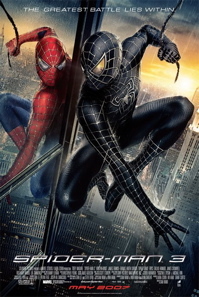 The movie, it seemed, focused more on the relationship between the couple rather than on Spider-Man and the villains. Though each character had its moment (Dunst actually sings…twice), I didn’t go to the movies to see a romantic comedy. There were so many characters, each having their own individual plotline, that the movie hardly came together in the end. Spider-Man 3 was two hours badly spent and an unsatisfying end to a once great beginning. Spider-Man 3 is one of the most anticipated movies of the year, and it did, for the most part, live up to the hype. Before I go on raving about the film, let me point out that it did have few flaws: a weak love story, leaving some questions unanswered (What the heck kind of freak experiment made Sandman … well, into Sandman) and, at 139 minutes, was a bit too long. But now that I got the few, and forgivable, flaws out of the way, we can proceed to the good stuff. This movie was action-packed and had some of the most amazing special effects I have seen. If you thought the movie 300 had insane special effects, you’ll be stunned by Spider-Man 3. Get Danny Elfman, the mastermind composer behind most Tim Burton movies like Edward Scissorhands and Batman Returns, to write the score for the film and you’ve hit the jackpot. The movie kicks off with Peter Parker, a.k.a. Spider-Man, leading a perfect life. His friends and family love him, the love of his life, Mary Jane (Kirsten Dunst), is living her dream, which is singing on Broadway, and the world adores him. He’s also on top of his mathematic studies. He’s on top of the world. That’s when reality kicks in, and his world comes crashing down. It all begins when some weird gooey substance comes flying down from outer space and attaches itself to Parker. Then and there, Spider-Man’s worst enemy is born: a villain that goes by the name of Venom. Before Parker knows it, Venom takes over him and he becomes his own enemy. The worst part is that he starts to treat the people around him horribly, including the person he loves the most, M.J.
As Parker is struggling with Venom, yet enjoying the strength and power that comes with it, his relationship with M.J. is on the rocks. His job as a photographer is on the line because of a new competitor—cocky and arrogant Eddie Brock (Topher Grace), who later also transforms into Venom when a little bit of the goo clings onto him. Not only that, but his former best friend, the child of the Green Goblin, is still seeking revenge on Spider-Man for killing his father. And Spider-Man is out to get his own revenge, by killing Sandman, the murderer of Parker’s grandfather. The plot is an absolute mess of problems for Spider-Man (I mean come on, does the guy really need three villains to deal with? ), but one of the most remarkable aspects of Spider-Man 3 is how well the story lines come together at the end, like a puzzle. Tobey Maguire has the Spider-Man role down to a T. I walked out thinking, “I can’t imagine anyone else playing that role.” He pulls off lines like “Shazzam!” and “Oh they really LOVE me!” yet he still looks like a tough guy. The movie wasn’t all serious and intense. It had its humor, too. The audience got a kick out of Parker turning into a “scene kid” after Venom takes over his body. It was amusing to watch Parker walking around with eyeliner and the trademark emo “flippy hair,” a hairstyle that has become popular in our generation. The movie was a lot of fun, and had its great moments, but it wasn’t as good as the first two. It didn’t have as many action scenes. The third is a more in-depth analysis of Peter Parker and how he juggles his personal life with life as Spider-Man. Nonetheless, the movie is definitely worth seeing.